Home » Is Jesus Serious? With Volume 4 of her popular Jesus Series, Barbara Garro brings Jesus to the People who want to understand Him better so they can love Him more. Is Jesus Serious? leads you toward your salvation. 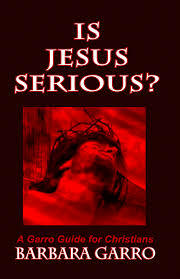 After His sacrifice to offer us redemption, how can there be any possible doubt that Jesus is indeed serious about our salvation? Thirty-three of Jesus’ teaching parable stories each have a focused chapter that contains a special Message from Jesus. Is Jesus Serious? is a guide that speaks to personal struggles of Christians as we work to find ways to meet Jesus’s and St. Paul’s expectations. “In her fourth book entitled Is Jesus Serious? writer and guide, Barbara Garro, gives us what I believe is her most personal reflections on the journey of faith. Ms. Garro takes her love for the parables of Jesus and takes us on an in-depth journey into their meaning and the challenges they present to us. “Once again, Ms. Garro brings us on a journey deep into the parables of Jesus but does so in her uniquely forceful, down to earth style. As we journey through each parable, we are invited to reflect upon the actual text and then to reflect on what it tells us.” Very Rev. Joseph C. Tizio, C. Ss. R.